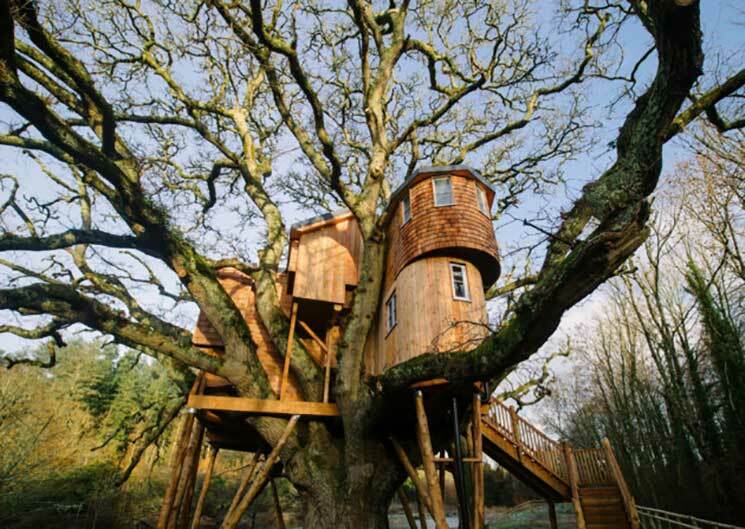 Head for the trees and bring out your inner child with a stay in one of these treetop retreats in amazing treehouses. For a very grown-up, luxury treehouse experience book one of these stylish suites set amid the tree canopy. With French doors opening out onto a glass-fronted veranda, guests can sit out amid the treetops and survey their surroundings. Inside, the chic and cosy accommodation provides a comfortable home from home in this tranquil setting. Picture the ultimate treehouse of your childhood dreams and it will probably look something like this! This sprawling, multi-level construction is perched amid the boughs of a 250 year old oak tree. Opened in January this year, the treehouse’s interiors contain the rustic charm of bare wood, in keeping with its treetop position, as well as one or two luxury touches. With five cosy cabins set in the tree canopy, connected by robe bridges and staircases that helter-skelter their way around tree trunks, these treehouses are set in a hidden valley in the heart of the Welsh mountains. Inside, tree and leaf motifs, along with wood-burning stoves and flickering candles, only add to the magical appeal. Inspired by the safari lodges of Africa, enjoy a night or two in Norfolk amid ancient trees in the grounds of Bagthorpe Hall. The cosy interior includes a king-size four-poster bed, copper bathtub and a wood-burner to curl up in front of in the evenings. Enjoy meals out on the deck with views across the grounds. This completely unique property was built by designer William Hardie along with architect and television presenter George Clarke. Set amid the forest, the simple interior hides many design features, including fold-away furniture. However, the most outstanding design aspect can be found in the triangular loft space, where it is possible to open the whole roof, as though lifting the flaps of a cardboard box, to admire the encompassing vista as well as the Dark Skies that the area has become known for. Set on the edge of a wood, the light and bright interior of this treehouse combines rustic charm with touches of opulence. With Persian rugs, leather armchairs and a roll top copper bath, if you’re planning to forego the room service and get back to nature, this is definitely the way to do it! Make the most of this treehouse’s sun deck to enjoy the far-reaching views of the surrounding countryside. Inside, the circular layout includes a king-size bed, kitchen and dining area as well as an ensuite complete with a monsoon shower. The treehouse is located within the boughs of a mature oak tree surrounded by 44 acres of private farmland that guests are able to explore. To reach the accommodation, guests need to make their way across a 24-metre-long rope bridge, which adds to the sense of entering your own private castle or fairytale kingdom before starting your adventure! This smart summerhouse on stilts offers a peaceful escape from the hubbub of everyday life, and with no kitchen facilities it also offers the perfect excuse to dine out in nearby Bath or the local pub just a few minutes’ walk away. To make life even easier, a breakfast hamper will be brought to your door every morning, leaving you nothing to do but relax on the bench swing beneath the treehouse.